Broeckhoven, Chris, Genevieve Diedericks, Cang Hui, Buyisile G. Makhubo, and P. le Fras N. Mouton. 2016. “Enemy at the Gates: Rapid Defensive Trait Diversification in an Adaptive Radiation of Lizards.” Evolution 70 (11): 2647–56. Mouton, P le Fras N, Janine L Glover, and Alexander F Flemming. 2014. “Solitary Individuals in Populations of the Group-Living Lizard Ouroborus Cataphractus: Voluntary or Forced?” African Zoology 49 (2): 307–10. Stanley, Edward L., Luis MP Ceriaco, Suzana Bandeira, Hilaria Valerio, Michael F. Bates, and William R. Branch. 2016. "A review of Cordylus machadoi (Squamata: Cordylidae) in southwestern Angola, with the description of a new species from the Pro-Namib desert." Zootaxa 4061(3): 201-226. Buchanan, S. W., Timm, B. C., Cook, R. P., Couse, R., & Hazard, L. C. (2016). Surface Activity and Body Temperature of Eastern Hognose Snakes (Heterodon platirhinos) at Cape Cod National Seashore, Massachusetts USA. 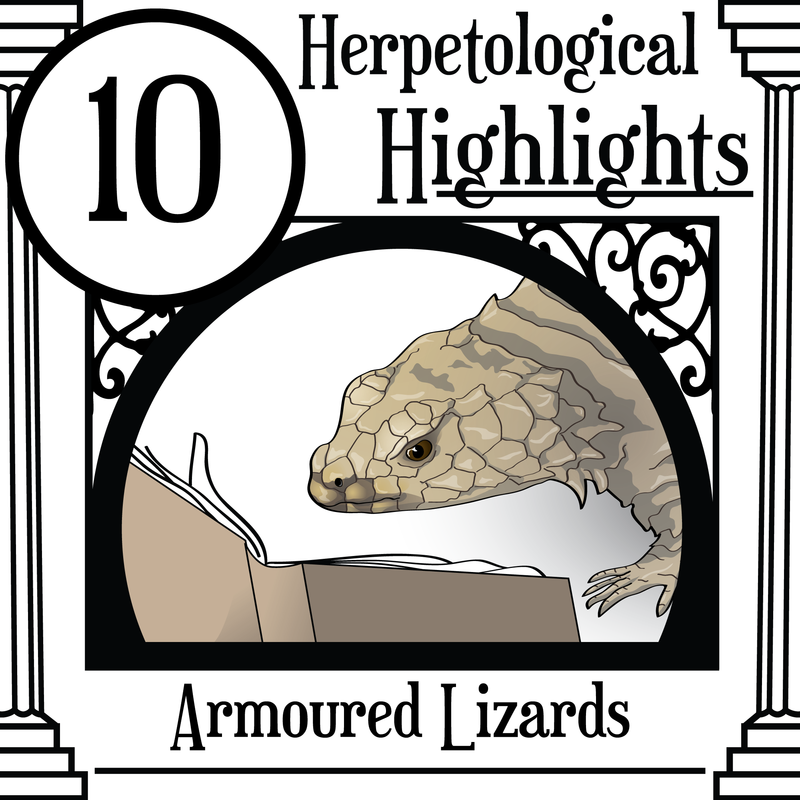 Journal of Herpetology. Ivany, L C, W P Patterson, and K C Lohmann. 2000. “Cooler Winters as a Possible Cause of Mass Extinctions at the Eocene/Oligocene Boundary.” Nature 407 (6806): 887–90. Lima, S. L. (1995). Back to the basics of anti-predatory vigilance: the group-size effect. Animal Behaviour, 49(1), 11-20. Losos, Jonathan B., P.Le Fras N. Mouton, Ryan Bickel, Ian Cornelius, and Lanral Ruddock. 2002. “The Effect of Body Armature on Escape Behaviour in Cordylid Lizards.” Animal Behaviour 64 (2): 313–21. Mouton, P., Flemming, A. F., & Kanga, E. M. (1999). Grouping behaviour, tail-biting behaviour and sexual dimorphism in the armadillo lizard (Cordylus cataphractus) from South Africa. Journal of Zoology, 249(1), 1-10. Stanley, Edward L.; Aaron M. Bauer; Todd R. Jackman, William R. Branch, P. Le Fras N. Mouton 2011. Between a rock and a hard polytomy: rapid radiation in the rupicolous girdled lizard (Squamata: Cordylidae). Molecular Phylogenetics and Evolution, 58(1): 53-70. Truter, Johannes Christoff, Johannes Hendrik VanWyk, and Pieter le Fras Nortier Mouton. 2014. “An Evaluation of Daily, Seasonal and Population-Level Variation in the Thermal Preference of a Group-Living Lizard, Ouroborus Cataphractus (Sauria: Cordylidae).” Amphibia-Reptilia 35 (4): 391–403. Zachos, J., Mark Pagani, Lisa Sloan, Ellen Thomas, and Katharina Billups. 2001. “Trends, Rhythms, and Aberrations in Global Climate 65 Ma to Present.” Science 292 (5517): 686–93. Woodhead, C., Vences, M., Vieites, D.R., Gamboni, I., Fisher, B.L. and Griffiths, R.A., 2007. “Specialist or generalist? Feeding ecology of the Malagasy poison frog Mantella aurantiaca.” The Herpetological Journal 17 (4): 225-236. Bee, M.A., Perrill, S.A. and Owen, P.C. 1999. “Size assessment in simulated territorial encounters between male green frogs (Rana clamitans).” Behavioral Ecology and Sociobiology 45 (3-4): 177-184. Biju, S.D., and Franky Bossuyt. 2003. “New Frog Family from India Reveals an Ancient Biogeographical Link with the Seychelles.” Nature 425 (2001): 711–14. Bossuyt, Franky, and Kim Roelants. 2009. “Frogs and Toads (Anura).” In The Timetree of Life, edited by S. Blair Hedges and Sudhir Kumar, 357–64. Oxford: Oxford University Press. Burghardt, Gordon M. 2013. “Environmental Enrichment and Cognitive Complexity in Reptiles and Amphibians: Concepts, Review, and Implications for Captive Populations.” Applied Animal Behaviour Science 147 (3–4): 286–98. Gerhardt, H. C., and J. Rheinlaender. 1980. “Accuracy of Sound Localization in a Miniature Dendrobatid Frog.” Naturwissenschaften 67 (7): 362–63. Günther, Rainer, Stephen J. Richards, David Bickford, and Gregory R. Johnston. 2012. “A New Egg-Guarding Species of Oreophryne (Amphibia, Anura, Microhylidae) from Southern Papua New Guinea.” Zoosystematics and Evolution 88 (2): 223–30. Jovanovic, Olga, Miguel Vences, Goran Safarek, Falitiana C E Rabemananjara, and Rainer Dolch. 2009. “Predation upon Mantella Aurantiaca in the Torotorofotsy Wetlands, Central-Eastern Madagascar.” Herpetology Notes 2 (1): 95–97. Mayer, Michael, Lisa M. Schulte, Evan Twomey, and Stefan Lötters. 2014. “Do Male Poison Frogs Respond to Modified Calls of a Müllerian Mimic?” Animal Behaviour 89: 45–51. Saporito, Ralph A., Maureen A. Donnelly, Thomas F. Spande, and H. Martin Garraffo. 2012. “A Review of Chemical Ecology in Poison Frogs.” Chemoecology 22 (3): 159–68. Vences, Miguel, Frank Glaw, and Wolfgang Böhme. 1998. “Evolutionary Correlates of Microphagy in Alkaloid-Containing Frogs (Amphibia : Anura).” Zoologischer Anzeiger 236: 217–30. Woodhead, Cindy, Miguel Vences, David R. Vieites, Ilona Gamboni, Brian L. Fisher, and Richard A. Griffiths. 2007. “Specialist or Generalist? Feeding Ecology of the Malagasy Poison Frog Mantella Aurantiaca.” Herpetological Journal 17 (4): 225–36.